Etgar Keret, with his collections The Nimrod Flip-Out and the recently published Suddenly, a Knock on the Door, reinvigorated the short story (and the short, short story). The author, whose work has appeared in The New Yorker, Zoetrope and on This American Life, recently spent a day in Los Angles, at UCLA, as a guest of the Israel Studies department, and at a reception in his honor at the home of Sharon Nazarian, president of the Younes and Soraya Nazarian Foundation, which sponsored the event. Keret, 46, explained that he sees himself as more "a Jewish writer than an Israeli one," because being Jewish, he said, "is my heritage." Being Israeli as a national identity, he said, is like "a tenant's meeting in an apartment complex: You all live together, but what do you have in common?" Keret said his kinship with Jewish writers includes the likes of Franz Kafka, Sholem Aleichem, Isaac Babel and Isaac Bashevis Singer. Yet, he could not be more Israeli. Keret has lived his whole life in Tel Aviv. His parents were Holocaust survivors from Belarus and Poland (his father died last year). His brother was tried and convicted for deserting the Israeli army for being a pagan and staged his first marriage as a performance art event, to which he sold tickets, and his second in a tree in Thailand. Keret's sister, meanwhile, belongs to an ultra-Orthodox community and has five children. Keret wrote his first short stories during his compulsory military service. Describing himself as a "horrible soldier," who came from a long line of horrible soldiers, he managed to be assigned to a basement computer room, where he served 24- to 36-hour shifts. And while there, he wrote. He said he suppresses many of his emotions, but he described fiction as, for him, "a safe zone" where he can take his anger and other feelings to unexpected places. Fiction is "a place of authenticity," where he need not lie -- there are no consequences as there might be in the real world. Tom Teicholz: The writers you admire, their works are all somewhat different than their reputation: Kafka is more modern and more funny; Aleichem is a master of satire on the level of Mark Twain; Babel is also funny and quite clever; and Singer is both funnier and darker, more macabre, than he is usually given credit for. So, how is your work different from how it's usually perceived? 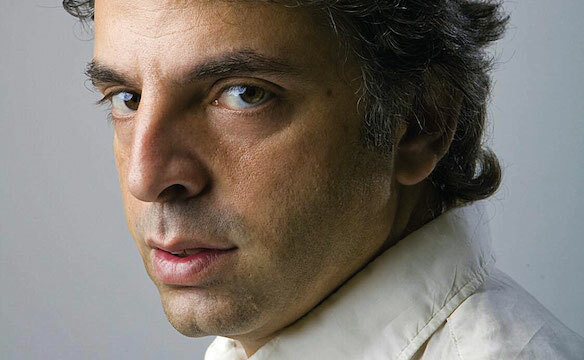 Etgar Keret: Different people ascribe different things to [my work]. I remember when I first published my book, I went to a big conference and did a reading, where some people laughed, and others were very angry. ... There is always this cocktail between the text and the reader. If you mix with water, you get something else. ... For me, the humor is an affect, armor to protect me from other things, and the core is something that is much more painful. TT: The other quality that distinguishes these writers is that their writing is very specific as to place but is considered universal. Is that true of your work as well? EK: I'm 46 years old, and my whole life I've lived in five places -- all in Tel Aviv or Ramat Gan [a suburb of Tel Aviv], all within a radius of five kilometers. I'm like Kant: All my life I've lived in the same place, walked down the same streets. My best friend, I've known him since I'm 3. His father came to fix our TV and didn't have a babysitter so he brought him along. I still see him every week. I'm like those Southern writers, who write about their town. ... As I said at the UCLA event, [when] you touch upon something that is a trait of a person, that is universal. You just have to zoom in enough. TT: In your new collection "Suddenly, a Knock on the Door," there's a story, "Creative Writing," in which you describe a creative writing teacher as having published a collection of stories that were "kind of a gimmick." Is that a reference to criticism you've received? EK: I write short stories, and publishers don't like short stories. They are always coming up with ideas [like]: Write [a collection of] short stories and the character in one begins with A, and the other will be B. Or how about you write short stories [where] each story takes place in another city in Israel? It always seemed like a very bull---- idea to me so I integrated it [into the story]. TT: How do you see your stories as different from other Israeli fiction? EK: I think, traditionally, Israeli writers tell the story of the group, of the collective. You have the kibbutz stories, the army stories -- basically [you] take these people who come from different countries and try to create a whole out of them. In that sense, when I started writing, I felt that there was a kind of resentment from [the] older generation of readers and writers. Like, 'We're trying to put something together and you're working against us." TT: That you're drawing outside the lines? TT: In what way did your parents being Holocaust survivors make you a writer: Do you see yourself as the witness, the translator of modern experience, and/or the entertainer creating a salve or distraction from their pain? EK: When I was a child, there was this thing that I would never cry if my parents were around. My mother saw her mother killed before her eyes. So it seemed like nothing that I had justified [crying]. I can remember that the most important thing was to make them happy. But my parents were happy people; they liked to celebrate. This idea of not showing emotion is something that is very, very strong, and there is something about writing that is, for me, is very, very much linked to suppression of emotion [that] I have to put somewhere. I remember being a soldier and having this fear -- it wasn't about showing my emotion, it was that I was afraid that I won't know what I feel -- that I suppressed it so deep that I wouldn't know if I'm angry or sad. And there's something about writing that releases that. TT: You were born shortly after the Six-Day War. In what way does that make what you write about Israel different from the writers who came before you? EK: The 67 generation, we grew up in the years where Israel was like the most popular country in the world -- they did the Entebbe movie with Charles Bronson; we won Miss Universe; we won [the] Eurovision [song contest] two years in a row. We were loved by everybody --- our basketball team won the European championship, and there was this feeling that we were like this wonder. During those years, Swedish girls would come [to Tel Aviv] hoping to find Israeli boyfriends. TT: Tel Aviv has changed so much in the last decade, even in the last five years -- it has a vibrant art scene, it's become a foodie haven and is known as the gay party capital of the world. Is it still your Tel Aviv? Or is it changing too fast for you? EK: When you go to New York, you see it's the museum of the 20th century, the same way that Paris is the museum of the 19th century. ... What's very strong about Tel Aviv, unlike Jerusalem, is that it's a city that's constantly searching for its identity. It's almost like there is a polemic about what this city is all about. ... At times I feel closer and at times I feel more distant. The only other city I can compare it to is Berlin, because there's something about Jewish identity and German identity where we are not completely at ease with our identities, with saying. 'This is what we are.' I think Germans and Israelis are the only people I know that when their national anthems plays, they're against it. ... Identity issues are very central. Even though no one ever speaks about it, it's always in the subtext. TT: There is another Israeli writer and filmmaker whom I'm very fond of, who is never mentioned in connection with your work, but who also wrote short fiction in colloquial Hebrew about the national character -- and that is [Israeli humorist Ephraim] Kishon. EK I grew up on Kishon. I really loved his work when I was a kid, I think one of the first books that I bought with my own money was his.... The thing was that because Hebrew was not his first language - what made it funny was that he would write about mundane issues in a very high register. [However] there is something about Kishon - he wanted you to laugh. And there is something about me that if you laugh, it was never my intention. .. Usually the stories that are my favorite, nobody likes. TT: What's an example of that? EK: When I wrote the story, "the Nimrod Flipout," I didn't think it was good. I thought it was too personal. We were three of us, my best friend and my other best friend killed himself. So I wrote a story about it and it's very autobiographical. My best friend was very excited that I wrote a story about it. [But} when I edited the book, I said to him, "the story is out." And my best friend said, "but it's great." And I said "it's not great. You like it because it's about you." So he was very sad, he called me on the phone and he said, "Tell me, how many years do I know you?" I said, "like 25 years." And he said, "In the 25 years that I've known you, how many favors have I asked from you? And I thought, and I said, "None." "OK. So after 25 years I think I'm entitled for one favor. OK, so you don't think the story is good, so you put it in the book not because you think it's good but because your best friend asked you to. " And I thought for a moment and I said," OK." I put it in the book and it became...When FSG (the venerable and prestigious literary publishing house Farrar, Straus and Giroux) bought the book, they said, "this must be the title story." Zoetrope published it. And it became one of my best-known stories. And the only reason I published it was because my friend asked me to as a favor. I have one story called 'Crazy Glue,' this is the story that got adapted the most times as a short film, more than ten adaptations. One of the adaptations is a romantic comedy; another one is a horror movie. And I think it's the story that allows you these two readings. [So you see:] I have really no understanding of how people perceive my stories.